[Kathy]: Ron Snell writes these. You can get them off of Amazon. It’s written from kind of a young boy’s perspective. Very humorous. But Eric and Bruce and Dad [Will Kindberg] are all mentioned in the books and it kind of just gives a taste of what it’s like as a missionary kid living on the. . . . You were commenting on “Really, your parents let your brothers do that!” Well, he kind of makes reference to many things his parents, who were also translators in a related language that we worked in, what his parents let them do as kids. Anyway, very fun. [Eric]: They’re like kissing cousins [the Machiguenga and the Ashanica Campas]. They’re very closely related, so the stories he tells about his experiences, we could have told some of the same experiences. [Kathy]: The river, going down the river on the raft, you know, that kind thing. But just living out in the jungle area and living on the Yarinacocha center where we were. so anyway, if you’re ever interested in some light reading, you can look that up on Amazon. What books would you recommend that capture the experience or place where the Eight worked, lived, grew up, etc.? This entry was posted in Lee and tagged Ashanica Campas, Bruce Kindberg, Eric Kindberg, Kathy Courtright, Machiguenga Indians, Peru, Ron Snell, Will Kindberg, Yarinacocha on September 1, 2016 by Dawn Duncan Harrell. 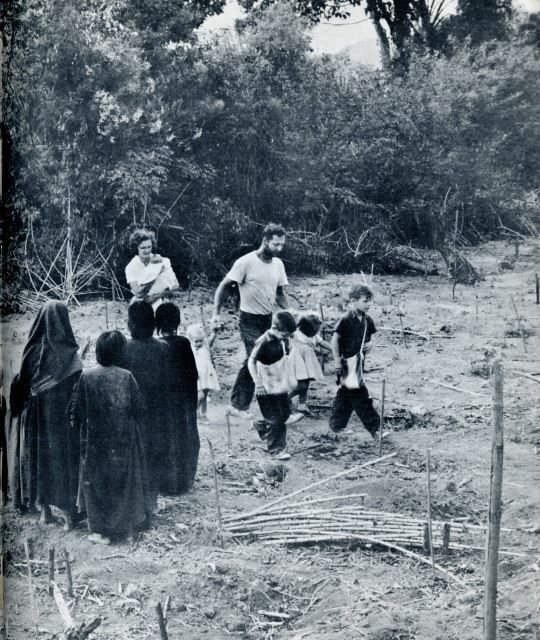 Nenquechani: The Kindberg family marches purposefully past a say, welcoming group of Campas, en route to a new house at Nenquechani, built by Will while awaiting his family’s return from a trip to Yarinacocha. The Campas wear the cushma, a course woven sort of Mother-Hubbard of immense practicality in the insect-ridden jungle. Cushma: Cushmas are worn by mean, women and children, with vertical necklines for men, horizontal for women. The natural brown cotton cushma may be thrown over one’s shoulder to allow freedom of movement, pulled up to allow crossing of rivers without getting it wet, and camouflages dirt very well. 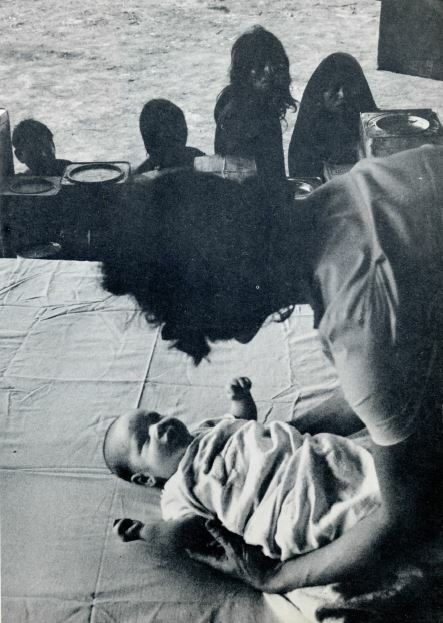 Privacy: Silently, these youthful Campa mothers watch Lee tend her youngest child. The Kindberg house has no walls. They learned very early in their relations with the Campas that privacy was impossible, that sharing the intimate daily routine of their household established a warm and respectful bond with the primitive Indians. “We put a ‘tucuyo’ (unbleached muslin) around our bedroom for some semblance of privacy, only to discover that the Indians loved to pick up the edge and peek underneath,” said Will. Shared Calling: Lee is a registered nurse, shares with Will an equal interest in missionary linguistic work in the foreign field. The couple met at Wheaton College in the U.S.A.; six months after their marriage [they] arrived in Peru to begin their life work. 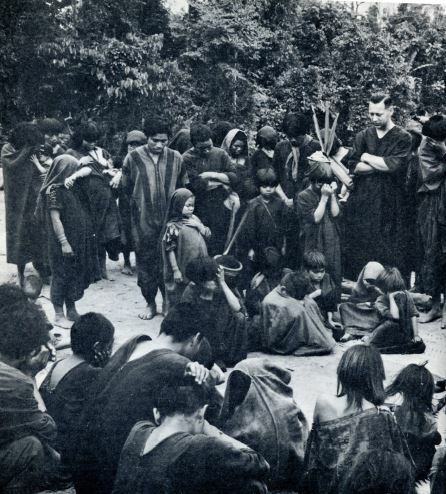 José Flores: In the Ene river village of Quempiri, Will consults with Campa Indian José Flores concerning text for the next day’s sermon, which José will deliver. Will, using his home, Nenquechani, as a base, visits other outposts in the Ene river area of the Peruvian Amazon. To reach the most remote places, he travels by canoe, raft, on foot, and occasionally uses the Jungle Aviation and Radio Service aircraft. 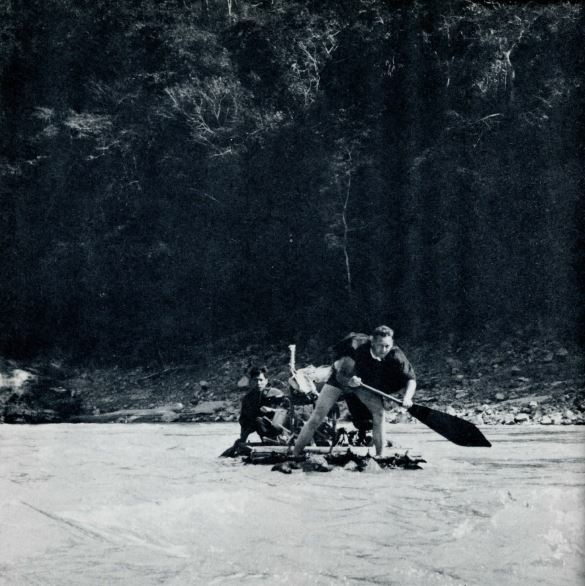 One such outpost is Quempiri, 35 minutes by plane from Nenquechani, but seven difficult days away poling upstream in a canoe. The school at Quempiri was built only last year. Teacher Flores was the first Campa with whom Will had direct contact nine years ago when he first began his language work in Peru. Before he came, many of the inhabitants of Quempiri had never seen a white man. Although Will visits Quempiri regularly, José Flores carries the main responsibility of this missionary effort. Nine years ago José could not read, write or understand Spanish, spoke only his own Campa tongue. 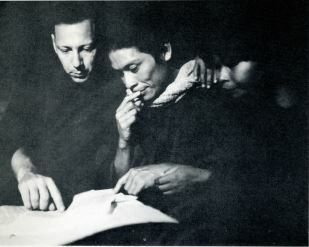 Teacher José Flores instructs Campa children at Quempiri under supervision of his old friend and mentor Kindberg. José has provided cultural, educational, spiritual, social and economic leadership in the tiny Quempiri community. He is classified by the Peruvian government as a bilingual teacher, receives a yearly salary of 4,500 soles ($174). So eager are the Campa to learn, that official attendance records at his school show 53 persons attending out of a total village population of 100. 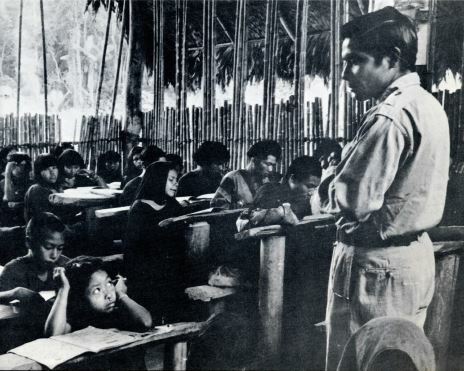 Among José’s students: his wife, Felícitas. José, encouraged by Will, learned to read and write, first his own language, then the national language of his own country. 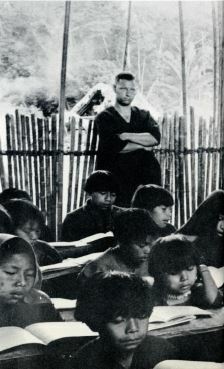 Now bilingual, in Campa and Spanish, and trained to teach by the Peruvian government training school for Indians of the jungle conducted at our Yarinacocha base José is an effective direct link between the Campa tribe and Peruvian national life and government. His desire to share his own personal faith in Christ with others, plus his ability to read and teach the Scriptures already available, have made him a spiritual leader among his Campa people too. Then Will, adding his word of instruction, said: “Jesus is in heaven, and we accept Christ’s resurrection as proof that there is resurrection and He will raise us up.” After Will spoke, the students sang “Onward Christian Soldiers” in the Campa language. 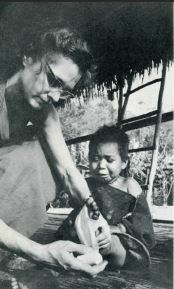 Nursing: In the daily routine of life a Nenquechani, Lee Kindberg bandages the punctured foot of a Campa child and introduces a huge forest parrot to young Dougie Kindberg. 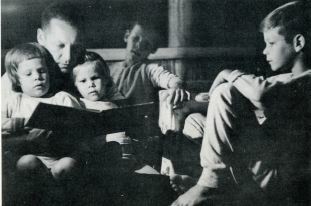 Little Kindbergs: After dinner at the Kindberg home, the family enjoys “reading time,” first for the girls, who perch on their father’s lap and listen breathlessly to “tonight’s story.” The Kindberg boys await their turn to hear their father read from “Paths and Pathfinders,” a basic reader. Afterwards the family joins hands and prays, Daddy and Mommy get “good-night” kisses. There is no fighting to stay up late, for the children are tired after the day’s occupations. Mission: A Wycliffe pioneer from New Jersey brings Christ’s Word to the Campa Indians, one of the 32 Peruvian tribes being served by the Wycliffe translators. Missionary-linguist Willard R. Kindberg, of Orange, N. J., is opening spiritual frontiers along the Apurimac river of eastern Peru, three hours’ flight time—or one month overland—from Yarinacocha, headquarters of the Peru branch of our Summer Institute of Linguistics. Shooting the rapids of remote Apurimac tributaries, it is Kindberg’s special joy to be on a spiritual frontier—a joy shared by his wife Lee, and five “little Kindbergs.” For all the Kindbergs, the privations and dangers of jungle frontier life is a spiritual adventure, rich in Christian service, and in the privilege of being the first to tell the Indians, in their own language, about Christ. An athletic, determined man, Will wants to see his Indians progress, pragmatically accepts the fact that, although he may imitate Campa dress and ways, he is accepted by them only as a representative of another way of life. He contends that the Indians will appreciate the Bible more if they pay for it in kind-bows and arrows or sugar cane. What do you remember of the visitor who took these pictures and recorded these vignettes? Doug was a baby in several of the photos, so they were probably 1961. 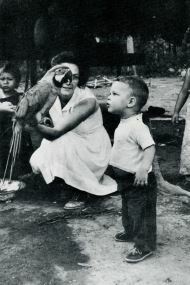 But the original article says “Dougie” is the child looking at the parrot (and Eric and Virginia confirm it was him), which would mean the article and picture were at least 1962. Can you confirm the date of the article? What else do you remember about Nenquechani? About the “old house” and the “new house”? Why did he have to build a new one? Did they finish the New Testament? Any of the Old Testament as Will desired? How many years were they there? Who else has articles about the Duncan Eight stashed somewhere that you might like to contribute to eightduncans.com? Can you scan them? Would you like to drop them in the mail? I can email you my address if you need it. Let me know in the comments box below. 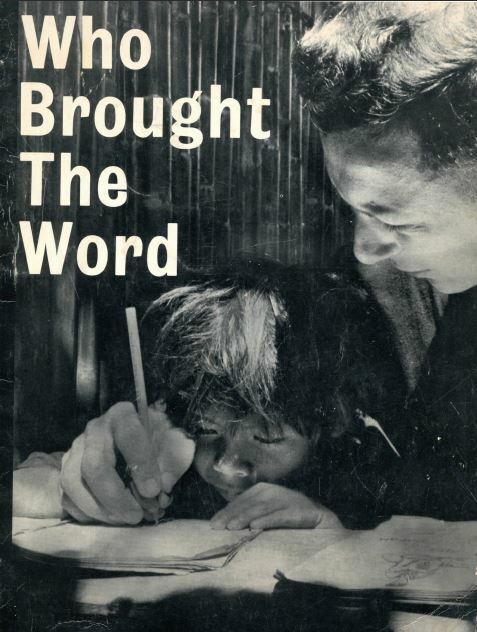 This entry was posted in Lee and tagged 1961, 1962, Ashanica Campas, Cornell Capa, cushma, Doug Kindberg, Eric Kindberg, Jim Duncan, Nenquechani, Wheaton College, Will Kindberg, Wycliffe Bible Translators, Yarinacocha on March 25, 2015 by Dawn Duncan Harrell. The past two and one half months have been happy ones for us as we have had opportunity [sic] to visit with members of our families and also to see numerous of you [sic], our friends. We have also enjoyed telling of the work of the Lord among the Ashanica Campas, and of their needs. We have been encourages by your interest and your prayers. It has been a time of spiritual and physical refreshing because of warm Christian fellowship and the cool and invigorating climate. Eric adapted well to his new environment here in the United States, too, and we are thankful to the Lord for a quick settlement on the insurance for his accident. We miss very much our other children who stayed in Peru, and we look forward to seeing them the end of this month. 1. Tribal teams to accept the challenge of learning a tribal language and culture, along with translating and teaching God’s Word [sic]. The task is difficult, the challenges great, but the rewards immense. 2. Teachers who would be willing to sue their abilities teaching missionary children (in English) on the mission field. There are mission schools in many countries, including Peru, badly needing grammar school and high school teachers. 3. 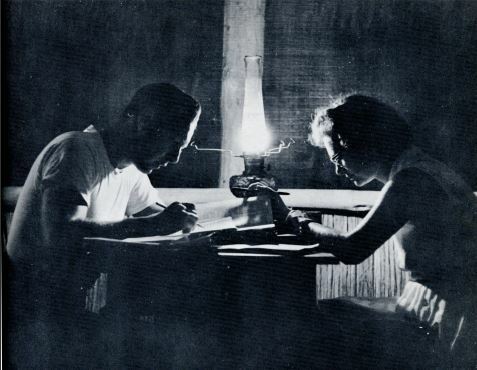 Typists who can greatly speed up the work of translators on the field by typing manuscripts of the translated Scripture portions, reading primers, and other books in tribal languages. In Peru right now much of our materials is awaiting a typist. Peru needs a few typists and so do several other mission fields. As we anticipate our return to the field, we would appreciate your continued prayers for the Indian believers and for us and our children that we might be physically, mentally, and spiritually well so that we can be the most use to our Lord in His work. Pray for us as we work on the revision of the presently translated Scriptures in December and as we prepare for new translation work in January—probably starting with the book of Romans. Eric’s accident is mentioned? Can Eric tell the story of his accident and why he needed to adapt to the United States? Can you? The address until November 15 is in Greenlawn. Were they staying with Aunt Polly and Uncle Bob? Can Polly and/or Colin, Gene, Andy tell the story from their perspective? How old was Eric in 1969? What were the “other children” doing in Peru? Were they old enough to look after themselves? Did someone else look after them? A Lima address is listed for Peru. Was the family still stationed in Pulcapa? Were they elsewhere? Can someone tell us about the Ashanica Campas: where they are/were, their language, their cultural characteristics, their dress, your friendships with them, their architecture, their mode of transport, their stories? This entry was posted in Bob, Lee and tagged 1969, Ashanica Campas, Eric Kindberg, Greenlawn, Lima, Peru, Virginia Gorman on April 3, 2013 by Dawn Duncan Harrell.